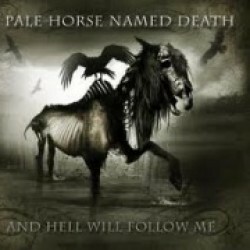 A Pale Horse Named Death (APHND) debuts with their album And Hell Will Follow Me. Though the musicians on this album are no rookies whatsoever. APHND is the new band of Sal Abruscato, who we know from Type O Negative and Life Of Agony. He plays almost every instrument on this album and is assisted by Matt Brown (Seventh Void a.o.) on guitar and production. With Sal his musical background in account you would expect to get served a combination of Type O Negative and Life Of Agony on this album. Unexpectedly the main source of influence is clearly Alice In Chains. The dragging riffs, the wailing vocals and the way the songs are structured, APHND breaths Alice In Chains. Some criticasters will point out that APHND is an exact copy (mainly to do with the vocal style of Sal, who sounds like a lesser Layne Stayley), but this kind of grunge is something that isn’t played a lot and which I dearly miss in the scene nowadays. APHND is not at the same level as Alice In Chains, yet. Not every song is as interesting as the other. The album starts of great with ´As Black As My Heart’, ´To Die In Your Arms’ and one of my favourites ‘Cracks In The Wall’ (starting with those typical Alice In Chains Dirt-era yeahs). After that the quality of the album takes a huge dip with some uninspiring songs and even repeating riffs that are already used on the same album! APHND is not ready to battle the big boys, but starts of on the right foot with And Hell Will Follow Me. Nice, decent album, which is recommended for people who are still in love with the nineties grunge period.